The most important aspect of choosing a shift scheduling software for your business, whether it is small, medium, or large is that it has characteristics that fit exactly to your needs. 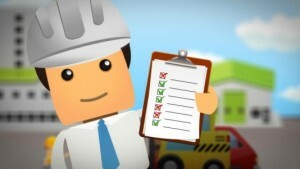 There are many benefits to using an employee scheduling software the foremost of which is elimination of errors in shift assignments. But there are also features that make improve efficiency in organization and management. 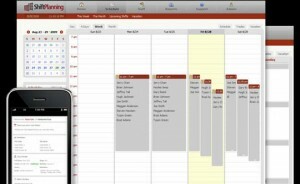 What follows are 10 scheduling software that you can choose from. It is up to you to decide which of them suites your organization best. Schedule 24 is easy and fast in coming up with an error-free scheduling for more than one branch or location. However, this program is effective for up to a maximum of 400 staff only. And the reason why it is not higher up on our list is that the user-interface is not as friendly as many people hope, and reporting tools are lacking. Hello Scheduling is reputed to be the fastest of all widely-reviewed scheduling software available today. We’re not sure how important a time clock is to your shift scheduling, but this very optimistic looking software has none. It’s been proven great at working out the kinks for around 150 personnel. And there’s no denying that the user-interface is rather pleasant to look at. This very promising software has an auto-scheduler that eases out on the employer’s task list but falls short on support services, so they say. Employees have the capability to edit the information themselves, but the service is not accessible online. So, it is fair to say that this software has its ups and downs but on the whole, it could prove useful enough indeed. 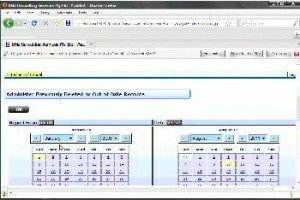 AceShift is web based but it is downloadable. 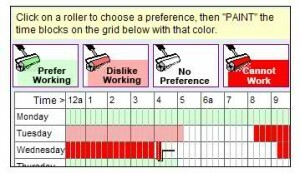 Once installed in your computer you can readily use it to facilitate a smooth shifting schedule for your employees. AceShift is available as a trial version but this free mode has significant restrictions as you shall see when you go beyond 20 shifts. There are tutorials available online for your perusal. Perhaps the reason why NimbleSchedule is preferred by many people is that it can be synchronized with Google Calendar, Facebook, and Microsoft Outlook. 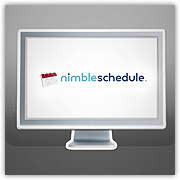 Nimble Schedule allows for staff to view their schedules when they access the Internet. They also receive e-mail notifications with regard to their specific schedules. We have to wait a while for this software to be available on mobile platforms, though. 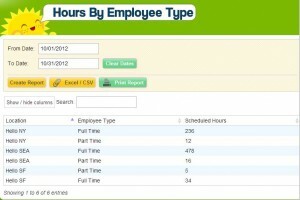 WhenToWork is a winner when it comes to creating templates and copying weekly shifts. Some of the less desirable features are actually what seems to be lacking: customer support via phone and live chat, which others programs offer. Still, it has features that are a notch higher than other software out in the market out there in terms of performance. TimeForge Scheduling has more options than others it seems: text messaging and e-mail, online access, and an overwhelming 40 reporting options (the most impressive by far, according to most). Like one other program presented here, this one has no time clock and some features are difficult to use. EZShift offers a three-month period free use of the program as a trial run of sorts. That’s a pretty generous offer considering that it has a few impressive features that would be worth paying for. Its main features include: customizable interface, automatic scheduling, full error elimination, and conflict resolution in real time. ShiftPlanning is cloud-based and that is such a huge advantage because this means the schedule can be accessed from anywhere. It is compatible with Mozilla Firefox, Internet Explorer 7+, Google Chrome, and Safari. And in addition, the shift assignments can be accessed from mobile platforms, with applications for Android, Blackberry, iPad and iPhone for starters. 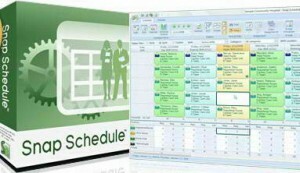 Snap Schedule is very conveniently set-up software with powerful tools for your scheduling conundrum. It also has editing features and can even analyze data in order to make your shift scheduling more efficient (and without the need for lots of overtime) based on the needs of your organization. Preparing assignments with any of the shift scheduling software should prove to be easier and much less burdensome for any manager. Maybe it is time to try new things. We are an Irish based start up and we are trying to reinvent Work Force Management for Restaurants, Bar, Hotels and more. We take the pain out of scheduling employees, track hours worked with our Timestation iPad app, and give managers instant access to all their HR files. We built Bizimply because we believe that restaurant and retail managers should always be out on the shop floor driving sales, but unfortunately they are all too often stuck in the back office under a mountain of paperwork. 1. 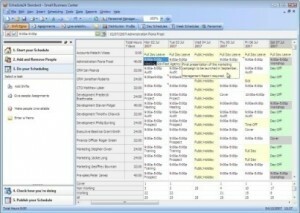 Our scheduling software uses HTML 5 drag and drop features so you can create, cost and publish your schedule in minutes. 2. We are specifically designed for multi-unit operators, you can seamlessly move staff between locations and bench mark performance between stores. 3. You can download our TimeStation app and it is immediately synced to your existing Bizimply account, giving you a live feed of who’s in, who’s out and who’s running late. Best of all it works even when you lose wifi connection. Look forward to hearing from you and it would great if you could include us in your next list.